The Content Filter allows you to view the course like a user with a specific tag and clearly see which stories are visible and which are not. When no tag is selected in the filter, all stories will be shown, as in the picture below. But when one tag is selected, only the tagged stories will be visible. For example: if you select the 'Brussels' tag in the filter, only the stories that users with the tag 'Brussels' can see will be visible. 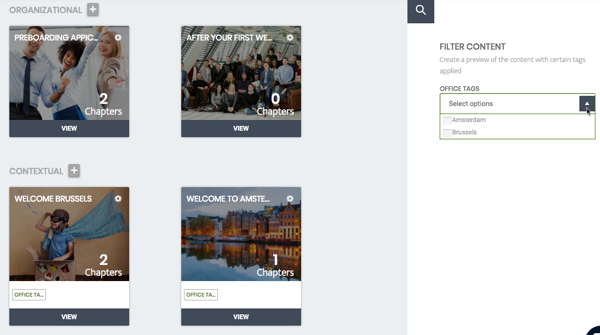 The story "Welcome To Amsterdam" will not be visible anymore, since a different tag is assigned to it ("Amsterdam"). If you haven't assigned any tags to any course, the Filter Content option will not be visible on your course menu page.